The seventh topic in the E-Learning 3.0 MOOC has been Community. I have invested quite a bit of my time over the years learning about community – or more specifically communities of practice. I have been a founder member of a community (ELESIG which is still going strong) and a facilitator/moderator in a community (CPsquare – which no longer functions as a community, but relationships still remain – see image below). I have attended courses on CoPs to dig deeper into the theory behind them (BEtreat workshops ), published three research papers about communities of practice and have written numerous blog posts. (I should add a page to my blog about this). I thought I had a reasonable understanding of what it means to be a member of a community, but this week has made me doubt this understanding. Why? I have been asking myself this question for quite a few days now, and today it occurred to me is that it is a language problem. The way in which language related to community is being used in this course about the distributed web, i.e. what we mean by community, consensus, trust and truth in the distributed web, is not how I have previously understood it. 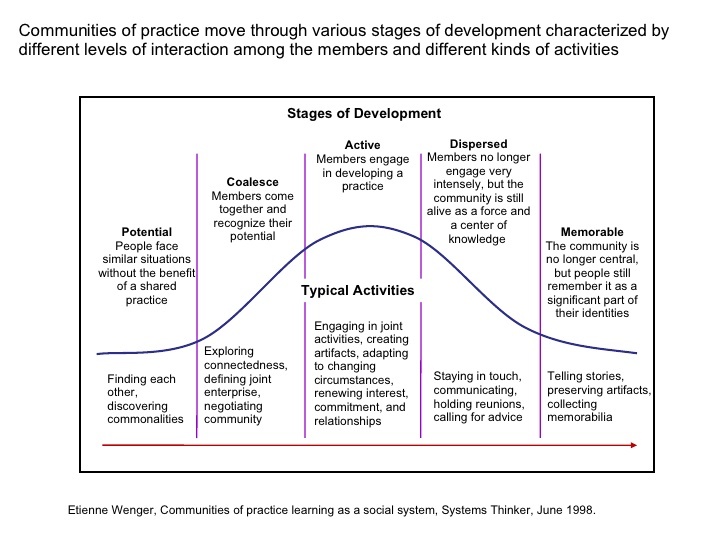 In other words, communities take time to develop, which is also depicted by the diagram above. If you were to ask the average cryptocurrency or blockchain enthusiast what the key single fundamental advantage of the technology is, there is a high chance that they will give you one particular predictable answer: it does not require trust. This suggests that trust either functions differently or doesn’t exist at all on the distributed web. Stephen and Pete both believe that trust is an aspect of community. So both trust and community on the distributed web, in their terms, seem to mean something different to Wenger et al.’s understanding of it. Pete Forsyth suggested that in Wikipedia (which I have written about in a previous post) we put our trust in facts and not in people. I can accept that on the distributed web it probably makes more sense to understand trust in these terms. That’s not to say that there won’t be trust between people, but perhaps we don’t need this on the distributed web. So the meaning of trust might be more limited term on the distributed web? In a draft document he has shared with us (I have typed draft in bold, so that we can acknowledge that it might change), Stephen distinguishes between what he calls ‘natural’ communities as opposed to ‘organised’ communities of the type discussed by Wenger and his colleagues. He describes natural communities, e.g. ‘your average city’, as lacking in trust, where there are enforcement mechanisms, because we don’t trust people to obey the law or rules. ‘Cities are polyglot, factional, disjointed. Yet, still – they are communities’, he writes. I have yet to be convinced by the idea that a city is a community. I believe that there can be and are communities within cities, but that cities are not communities. I agree with the author of this post about ‘What does community mean?’ where s/he has written: ‘just living near each other, as in a suburban neighborhood, doesn’t mean you’re in community.’ (The rest of the post is also interesting). ‘Neighbourhood’ may be a more appropriate term for a city, as Mike Caulfield suggested for FedWiki – which could be described as a decentralized distributed wiki (see my previous post for further discussion) and ‘network’ may be more appropriate for the distributed web. But there is a reason for Stephen’s focus on community this week, which seems to be that working on the distributed web requires consensus; consensus to agree on what information can be trusted to be true. How do we achieve this consensus on the distributed web where there is no ‘leader’ and no ‘common ground’? Stephen believes that we do this through community and that community is consensus. My question is, do we have to have community for consensus on the distributed web? Unless I have completely misunderstood this, the evidence from Preethi Kasireddy’s post How does distributed consensus work? would seem to suggest that the answer is ‘No’, unless we are attributing the word ‘community’ to non-human actors. I have a horrid feeling that I have completely misunderstood all this, but from where I am standing, the word ‘community’ being used in this context just does not fit with any of my prior understanding. In relation to achieving consensus on the distributed web about what information we can trust, we are told by Waggoner et al. that there are many consensus methodologies, to the point where they have written a paper questioning whether there is a consensus on consensus methodology. From this article we can see that many researchers are working on how to achieve consensus in relation to the trust we can put in facts on the distributed web. But what about in society? What are the consequences of a consensus driven society which relies on agreement. As John Kay wrote way back in 2007 in his article ‘Science is the pursuit of truth, not consensus’, ‘Consensus finds a way through conflicting opinions and interests’. (The Financial Times has blocked me from posting a link to this article. You will need to ‘trust’ me that this is what he wrote!) Kay seems to suggest that consensus is often arrived at, at the expense of truth. If this is so, should we ‘trust’ in the ‘truths’ arrived at by consensus? This plurality of words, and the absence of a reference word, is not unlike the philosophy conveyed by crypto-currencies: instead of a centralised mode of governance (validation, certification), it is a global validation by a network, a consensus, which will prevail. Have we changed our definition of what truth is? 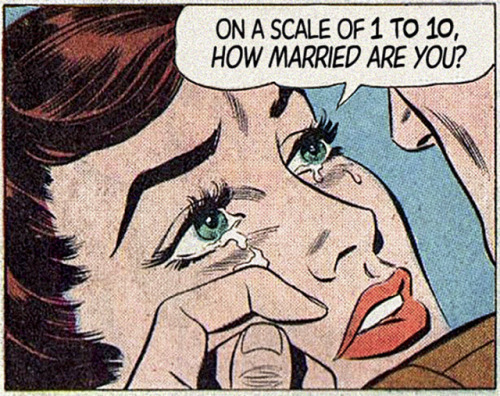 This resonates with me because this week I have been asking myself similar questions. What does community mean in relation to the distributed web? Can community function on the distributed web? Do trust, community and consensus take on different meanings on the distributed web? Perhaps we need to go back to what these words mean and whether they have taken on different meanings for use in discussion about the distributed web. Rich, difficult topics to grapple with — right where learning happens! PS — and you used a comic as a photo header! As a non-native in English, I am very confused. Isn’t the term ‘community’ also used just for places (villages/ towns) of a certain size? Such that the ‘community orchestra’ is an orchestra in such a place, which is different from the ‘orchestra community’ that might develop (with growing trust between people) within this orchestra group?. I tried to distinguish the two senses of community by: having a common goal (the orchestra, to make great music) or a having a common ‘fate’ (the village, e.g. to finance their sewage treatment). I think you are right that it is a matter of language. I am confused too Matthias, which is probably very apparent. It’s not your English! As you have identified (and as Stephen identified) the word ‘community’ can be used differently in different contexts. I would not call the whole village where I live, a community, although there are communities within the village, e.g. the church community, the school community, the drama club community and so on. I can’t think of a common ‘fate’ for the village, but I need to think about it more. I haven’t thought about it in this way before. I do feel very unclear about what we are meant to understand by community in the context of this course. Thank you for this Kevin. As Stephen has said – ‘this basically completes the Task for week 8’ – and it also means that you have been able to expand the task as you originally suggested. Would this have been possible if we were much larger in number?